With the release of MicroStation V8i (SELECTseries 3) we now have the ability to preview MicroStation design files in Windows Explorer and other Windows Applications. Options include panning and rotating DGN files right from the preview pane in Windows Explorer. 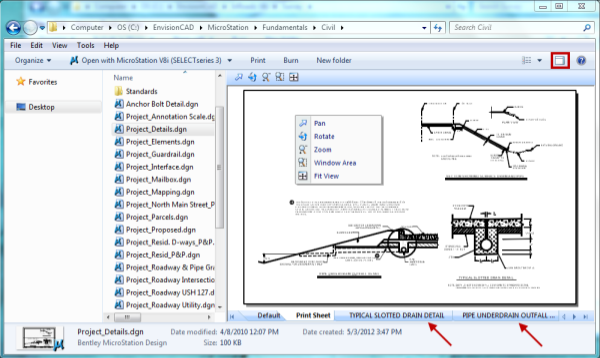 Searching text inside the MicroStation DGN document can also be accomplished using the Windows Explorer search box. From the Window Explorer dialog toggle ON the Preview Pane. Select a MicroStation DGN file. The Preview Pane will show the view navigation tools along with any additional models that exist as tabs. From the Window Explorer dialog type the keyword in the Search Box. 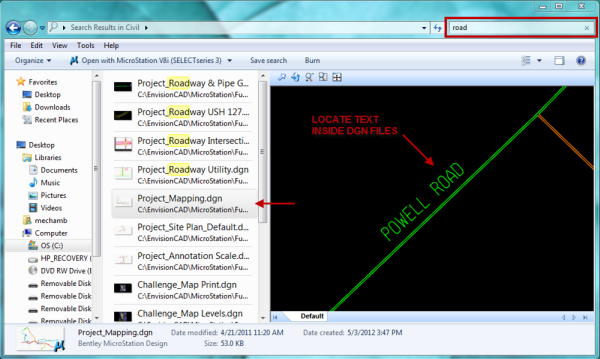 In the list of search results select a file to locate the text within the MicroStation file.